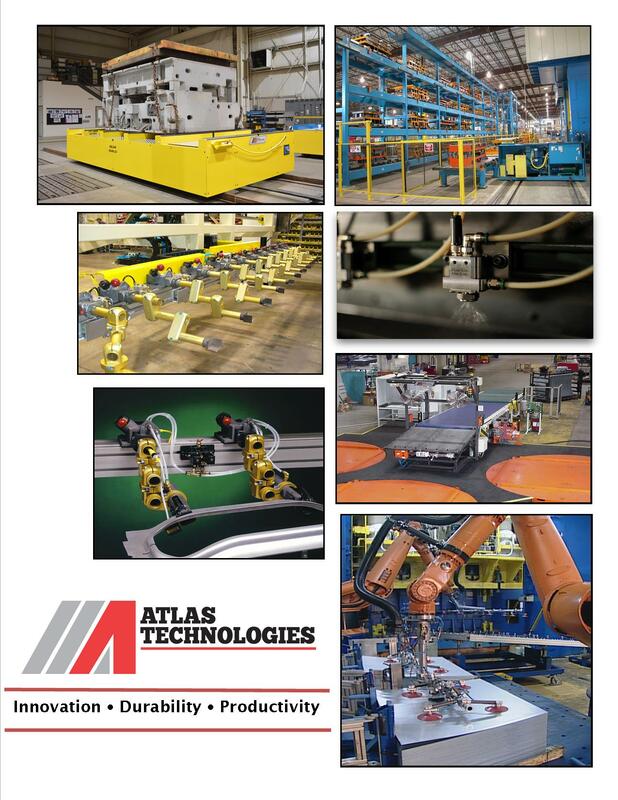 Atlas Bundle Turnovers (Part Inverters) automate the process of rotating an entire stack of materials 180°. This process is utilized in pressrooms to create opposite handed parts while eliminating the need for a second die. Part Inverters are also utilized to reorient stacks of blanks to a specific location on a pallet for specialized destacking operations. A Bundle Turnover eliminates the difficult task of reorienting blanks by hand or by crane and reduces the likelihood of damage to blank or material quality. This technology has also been utilized to turn dies over and separate them for cleaning and maintenance. Bundle Turnovers may be utilized with any type of material, such as stacks of steel blanks, steel plate, aluminum, marble, Corian, etc. or objects such as molds or dies or crates. Atlas “C Frame” Bundle turnover is designed for loading and unloading via fork truck or AGV. Items are placed in one side, rotated and are delivered to the opposite side. The C Frame style of inverter requires no peripheral automation such as in-feed conveyors. Its load opening spans the entire length of the clamping platen and can accommodate a wide variety of stack sizes. Design is based upon customer specified lengths and weights. The “soft touch” clamping feature ensures gentle handling for surface finish quality. The C frame style turnover may be used with steel or wood pallets. All stacks are loaded and removed from the inverter on pallets. Atlas’ barrel shaped Bundle turnovers are available in two configurations. The “Barrel End” Turnover is designed to load material through the front and exit through the opposite end of the barrel (rear). And the “Barrel In/Out Same Side” Turnover is designed for loading material in one end, flipping 180º, and exiting out the same end. The barrel design load table will accept a stack of blanks loaded onto one of two different sizes of steel pallets. All stacks and pallets are loaded and removed from the turnover on subplates. This provides a common size plate to move the stack on the pallets into and out of the turnover. An in-feed conveyor then moves the pallet onto the inverter, the plates rise and then the bundle of parts will rotate 180º and exit per it’s configuration.